"Some days you're the windshield, and some days you're the bug. 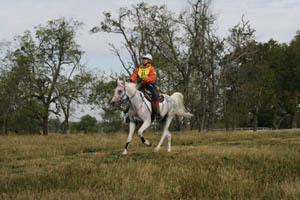 Today, we were the bug..."
So said Ed Kidd, after his horse Merlin, ridden by Lithuanian rider Alisija Zabavska-Granger, was pulled from the World Endurance Championship after the second vet gate for lameness. There were more windshields than bugs at this year's Championship - the 55% finish rate was the highest ever for an Endurance Championship at the World Equestrian Games - and there were some shocking results after the day had ended, both good and bad. The start took place under partly cloudy skies and with a chill breeze lifting the participating nations' flags above the head of spectators lining the starting line. It was expected to reach the 70's with a slight chance of rain during the day. 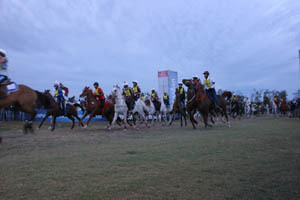 Cheers broke out as the field took off at 7:30 AM, with Maria Alvarez Ponton and Nobby, several UAE riders, and Uruguay's Paula Fort on Campanina waving her arm in a happy salute, leading the way. 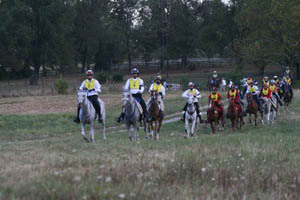 The start was smooth and mostly orderly aside from a few sidestepping and head tossing equines. DJB Boomer, the mount of Namibian rider Olivia Matthaei was a bit spunky, thinking he'd try swimming upstream once or twice, before he got lined out with the rest of the Namibian team, Kordula Voigts on DC Macproof, and Anna Wucher on DJB K D Fantasia. Canadian Ruth Sturley's mount RBF Super Sport was so Super Excited, Ruth was having a bit of trouble getting out onto the course. Announcer Ian Williams kept saying, "Ladies and gentlemen, please be quiet. Quiet please" - which made the spectators cheer - "Please be quiet. Ladies and gentlemen. Please" - which brought on more cheering. Ruth eventually made it out under the starting line. A pile of us photographers and videographers were escorted to two vans - which were already full - that we crammed into, and were taken out on course to a place to catch the riders coming by in the middle of the 32.5-km first loop. As expected, leading the field of 100 starters, was a group of 4 UAE riders, including Shaikh Mohammed and his sons Shaikh Majid and Shaikh Hamdan, followed closely by Maria Alvarez and Nobby, all averaging over 21 km/h (13 mph). The first two dozen riders were tightly packed together. 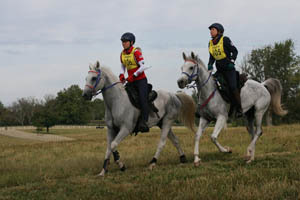 Also packed in with the frontrunners were Dutch rider Carmen Romer on Tuff Enuff FA, Shaikh Nasser of Bahrain on Khandela des Vialette, Lithuanian Alisija Zabavska-Granger on Merlin, and US riders Meg Sleeper on Syrocco Harmony, Lindsay Graham and Monk, Deborah Reich on DJB Juniper, and Heather Reynolds and Ssamiam. Pacing a little further back were French riders Jean-Philippe Frances on Hanaba du Bois, and Cecile Miletto Mosti on Easy Fontnoire. The French riders had a look of intense concentration, while Jan Worthington smiled and waved as she went by on a perky and fluidly moving Golden Lightning. 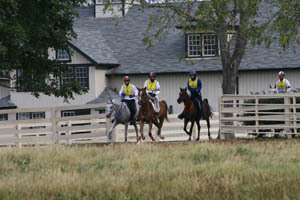 As the riders continued to complete their first loop (Shaikh Mohammed first, Maria Alvarez second, Shaikh Hamdan third), we moved on to the next spot on the 39.9-km second loop for photos, the lovely Castleton Lyons farm, a (renamed) farm that began back in 1793 and was once was the home of great thoroughbreds, standardbreds, and saddlebreds. In 1908, the farm, then owned by James R Keene, possessed "the greatest lot of (Thoroughbred) race horses ever owned by one man." 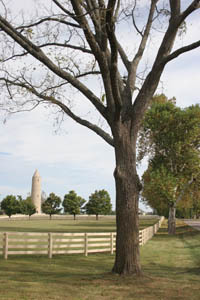 It made you think, as you looked out over the miles of white-fenced paddocks of the Kentucky Bluegrass (which was brown from lack of rain the past 3 months), of how what great hooves had trod where we were just standing. 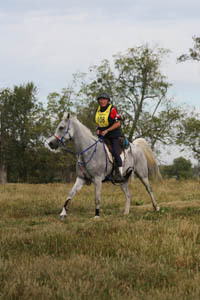 Endurance ride manager Emmett Ross had to get permission from a lot of private land owners to allow the ride to cross their properties. 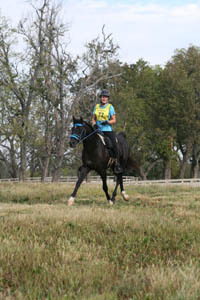 Emmett is no stranger to every facet of the sport of endurance, having done everything from FEI equestrian sports manager, trainer, coach, chef d'equipe, and rider (including a 3-time top ten Tevis finisher). 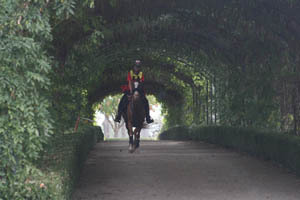 On this farm, the riders zig-zagged between their paddocks, right up the driveway to the mansion where a brunch was happening on the balcony, where the guests could cheer for the riders, and on through an ivy-covered arch. Cantering first past the barn and across one of the spacious paddocks were again Sheikh Mohammed and his sons, and Maria Alvarez on Nobby. They were averaging 20 km/h on this loop; Maria said later "I thought it was too fast," but she had to keep up with them. All the horses appeared to be handling it well. Cantering around the corner in 8th place, just minutes behind the leaders was a great big smile followed by Alisija Zabavska-Granger on Merlin. Merlin had his eyes set on those leaders and he had a load of confidence backing him - he'd finished 49 of his 57 completions in the top ten. Nobody had told him this World Endurance Championship was different from any other race. As owner Ed Kidd said at the previous day's vet in, "He's been through all this before." 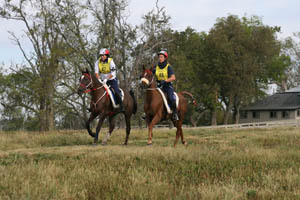 Four of the Americans were close together, with Jan Worthington and Golden Lightning just a few minutes back of them. Possibly the other happiest person with the biggest smile of the day was Indian rider Mustafa Tehrani. He had, as he said after the ride, nothing less than a goal of standing on the Podium with his "great horse", AF Big Bucks, a former racehorse owned by Pam Weidel. All was going well and according to plan until he and his horse had a bad fall later in loop 2 in a creek, 5 miles before the vet gate. "Both of his legs went right into the water and I flipped over completely!" he said later. "The whole horse flipped over me. I was under the water, and the horse's hind leg hit my hand. I was lucky that I am alive!" 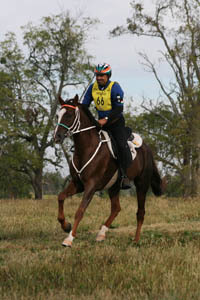 The horse ran off but was caught by someone shortly; Mustafa remounted and continued along the trail. The horse was sound at his trot out and came away in 17th place, though afterwards Mustafa would say he could feel a little tightness developing in AF Big Bucks' shoulder as the day went on. A little further back than expected was Dutch rider Carmen Romer... but it was good to see her. One of the Dutch photographers had gotten a call while we were setting up positions at this farm, that Carmen had fallen off her horse. He'd kicked out at another horse behind him, tripped and fell to his nose. Carmen tumbled off while Tuff Enuff FA kept on going with the group he was in. 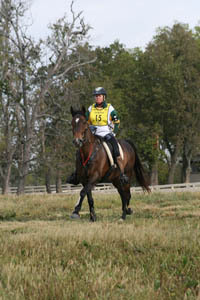 A steward caught him and got the horse back to Carmen; she remounted and continued on the trail. She and Tuff Enuff FA still came away from vet gate 2 in 12th place, giving no hint of their spill as they cantered by us on the farm. Jean-Philippe Frances and Hanaba du Bois were moving comfortably along (his horse in a side pull, instead of a bit). They'd left vet gate 1 in 16th place, and would leave vet gate 2 in 5th place, while holding almost the exact same speed, of just over 20 km/h. 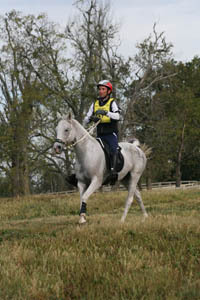 This outstanding 15-year-old mare won the European Championship in Portugal in 2007, and this year won the 160 km ride in Compiegne, France, averaging 20.049 km/h. This pair was certainly one of the favorites of the ride. They rode as individuals. In fact the entire French team was strong (as usual). 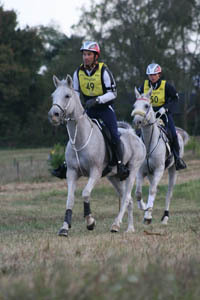 Virginie Atger on Azim du Florival, and Cecile Miletto Mosti on Easy Fontnoire were pacing together. Azim du Florival, a young 8 years old, had finished all 5 of his European races, including winning the 160-km Rambouillet, France in June of this year. Easy Fontnoire, also 8, traces back to the great French (Russian bred) stallion Persik, and had completed all 8 of his races with his best finish a 3rd place at Compiegne CEIO in May. Australians Penny Toft on Don, and Matthew Sample on Tom Quilty winner Tarrangower Crecendo were riding together around 30th position, averaging 19.5 km/h. Further back in the pack, riding together were 3 of the Canadians, Elroy Karius on Apache Eclypse (a 3000+ mile horse who got 2nd and BC on the Carolina 100 in November of last year), his wife Gail Jewell on NL Temptation (a 2000+ mile horse who had finished 40 of his 41 starts, and completed 7 of 7 100-milers including a win in the same Carolina 100), and Bob Gielen on FC Galaxy (a 2000+ mile horse who last won and BC'd the 75 mile Canadian Championship). The two vans were supposed to honk for us before we all left, and we (me, Genie Stewart-Spears and Shelley Deal) told two other photographers, "Don't forget us! ", and maybe that all happened, but about the time we heard a van honk and we came running, we three (troublemakers?) were left alone on this beautiful horse farm with a big brunch party going on. Genie luckily had the phone number of one of the drivers, who had to come back and pick us up. We were quite tempted to knock on the front door and ask for badly needed cappuchinos, which I was sure they were serving, but the van showed up just in time before I embarrassed us all. It didn't matter anyway that we'd missed our van and wasted time, as our group of press were turned away from the next private farm (the owner apparently changed their minds about us coming on the property and photographing there) - so we returned to the venue in time to see the front runners arrive into Vet Gate 2.